Thank you for your interest in helping out! As a small but growing nonprofit, we are grateful to our volunteers for the integral role they play in growing the local food system with us. Farm Fresh RI generally has year-round volunteer opportunities, with higher needs and more types of work available spring through fall. Provide customer service and assistance to shoppers. Help set up the market, and help farmers load in. Help run card machines and distribute Fresh Bucks at Welcome Tables. Shifts available most days of the week July through October. Saturday shifts available November through May. Help Farm Fresh RI track the impact of our programs by assisting with data entry and analysis. Very important work! Practice skills with Microsoft Excel and Access. Farm profiles: Visit farms, gather their story, take pictures, and update their profiles on our website. Blog entries: Have a knack for writing? Any issues around local food that are important to you? We love guest bloggers. Help Farm Fresh RI spread the word about our programs. Work in the office preparing outreach materials and/or hit the streets and deliver posters and flyers to local businesses and community centers. Opportunities available year-round, though the biggest outreach teams needed in May/June and September/October. For early risers and team players, learn what’s in season and be active in the a.m.
Help pack up local food for restaurants, schools, hospitals, etc. Packhouse shifts available Tuesdays 6:15-9:00am & Thursdays 5:15-9:00am. Or help out in the office organizing Market Mobile paperwork — requires attention to detail and middle-of-the-day availability on Monday and Wednesday afternoons. For outgoing and energetic individuals who enjoy interacting with kids and families. Help facilitate nutrition education and food systems activities at farmers markets. Summer and fall opportunities available beginning in July. Help with local food activities and cooking demonstrations (senior centers, classrooms, cafeterias, gardens). Help prepare and serve samples featuring local produce. Weekday morning and afternoon opportunities available. 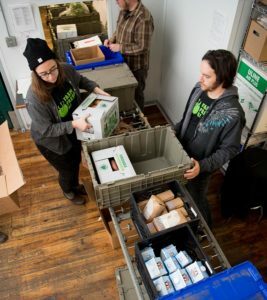 Twice a week a team of volunteers and staff work together to aggregate fresh, locally grown products dropped off by local growers into the orders placed by wholesale buyers. 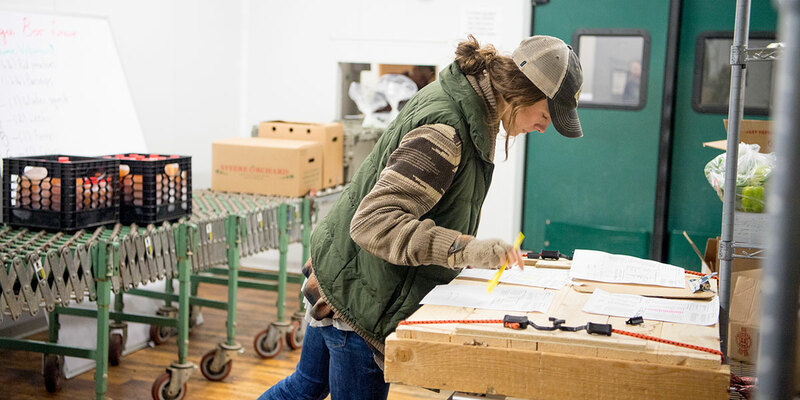 Delivery bins are packed with food for each wholesale customer and pushed down the line in our Packhouse in Pawtucket. Then our driver team packs the bins onto our trucks and delivers them out to wholesale buyers throughout Rhode Island and the Boston-metro area.